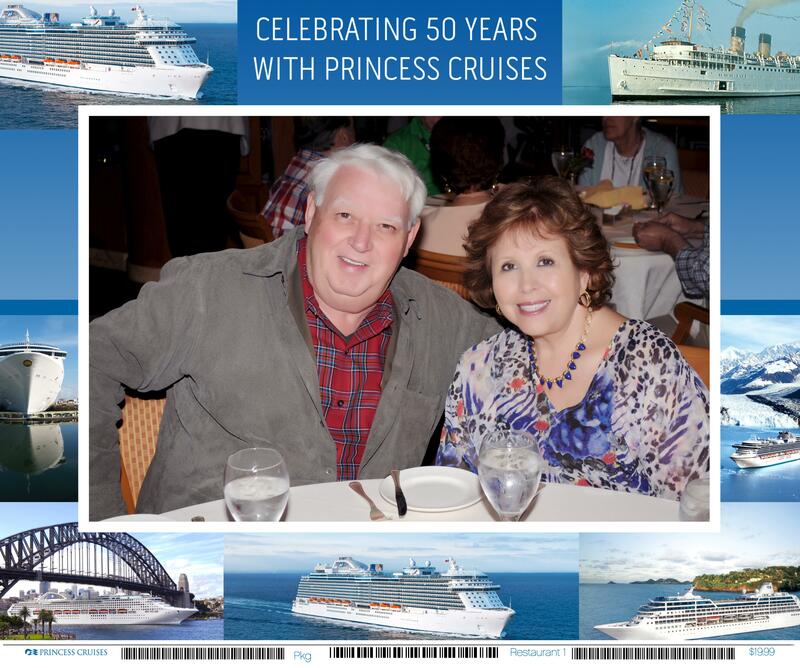 We’re on a three-week cruise celebrating our 50th anniversary, along with the Caribbean Princess Cruise Line! 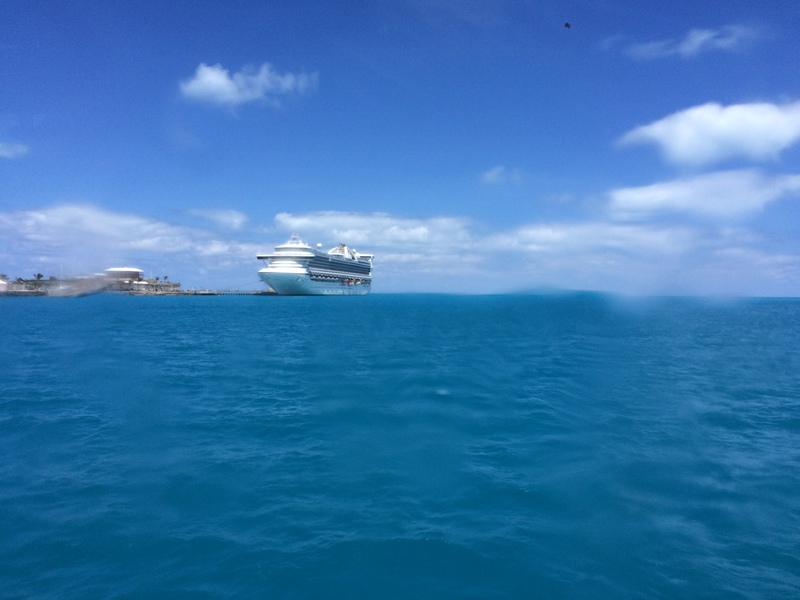 Trying to make up for lost time, the Caribbean Princess sailed away during the wee hours of the morning on Thursday, April 21, leaving Port Everglades in our wake and headed for the next port destination, West End – Bermuda. Just call us lazy because for the past few days we have requested breakfast delivered to our room to enjoy as we watched a little news on TV, and kept current on the ship’s course. We decided to take our paperbacks out to the deck chairs for some contemplation and relaxation. We have settled into our lazy days, gourmet meals and live entertainment every evening. Tonight will be our first formal evening, so we made sure that we had our party clothes ready to go to the Coral Dining Room on this always-fun occasion. The dinner was a culinary delight, unfortunately, I felt ill a while later and stayed in my room the remainder of the night. These things do happen and it’s a good idea to pack Imodium for such occasions. The next day is Friday and I thought it best to take it easy and do some reading on the balcony, which is really an awesome alternative! The weather is in the 70’s, mild and pleasant. The views of the Atlantic are spectacular in its deep, aqua-blue sereneness. 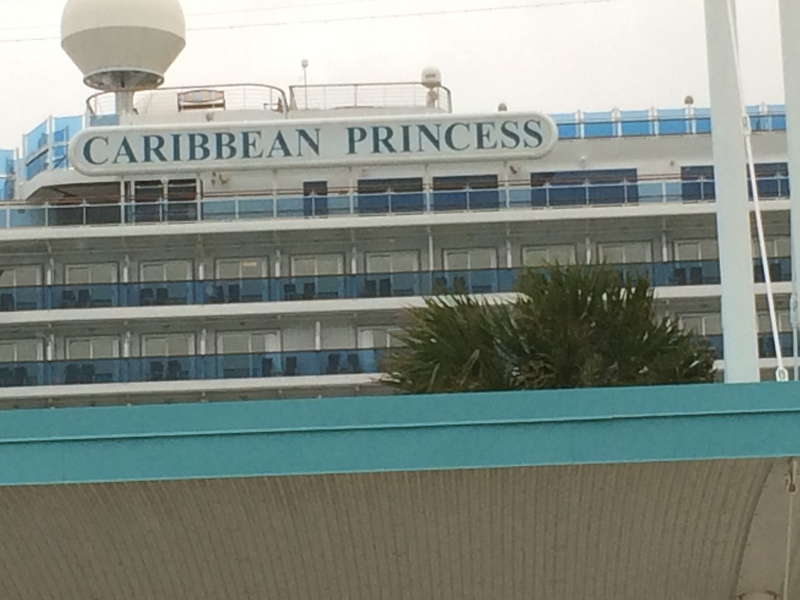 The Caribbean Princess is back on schedule. 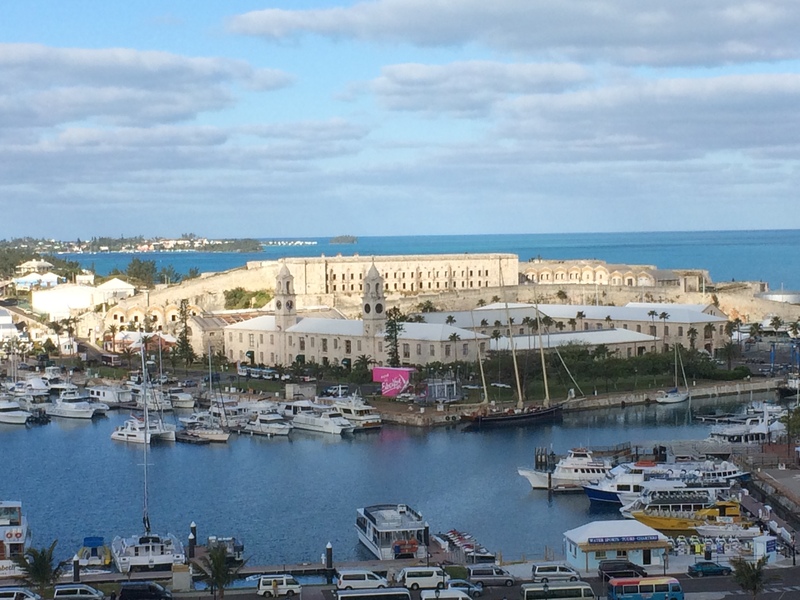 Today we would prepare for our arrival in West End Saturday morning April 23 around 7 a.m., by watching a presentation on Bermuda. The island offers glass-bottom boat rides, an aquarium, museum, zoo and several golf courses, plus lots of beaches and water adventures! 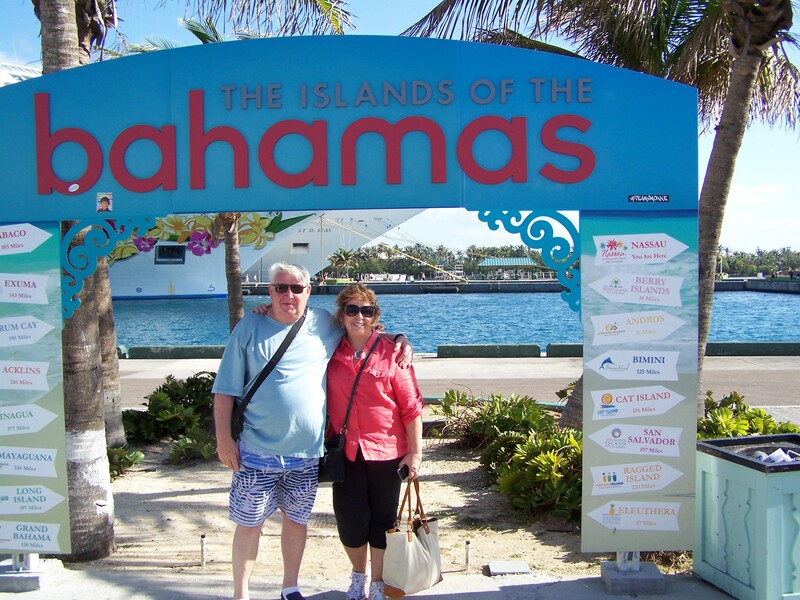 We were planning a tour on our own and take a boat ride from West End to Hamilton, then take a bus back to the port area, or vice versa, with our friends Don and Margie. This island is quite spectacular! 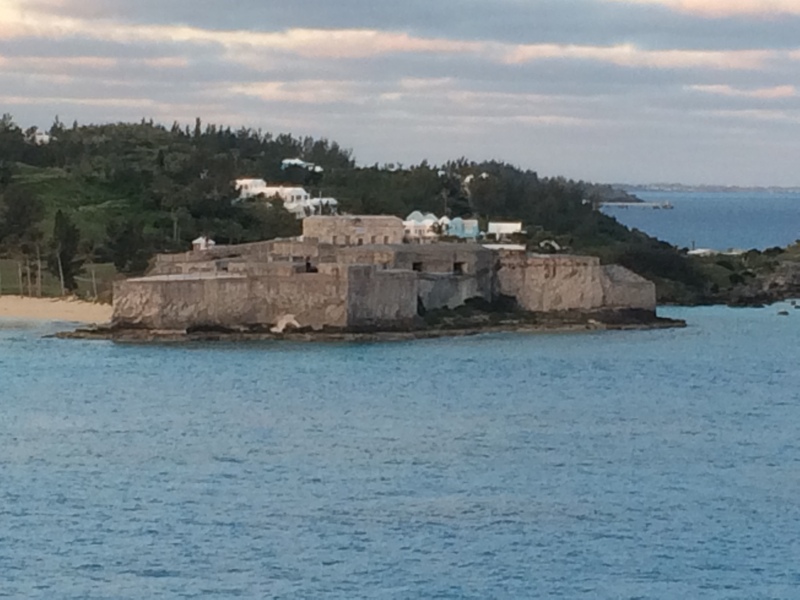 As we near our destination, from our ship we can see the British Royal Navy WWII staging area in our sights. The weather is perfectly pleasant and in the 70’s. 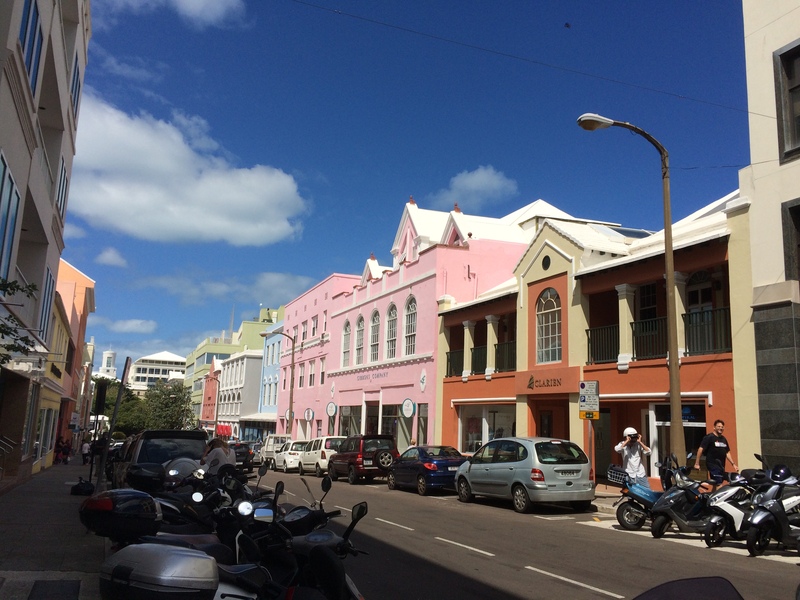 West End, Bermuda, is a bustling place full of tourists, buses and traffic. 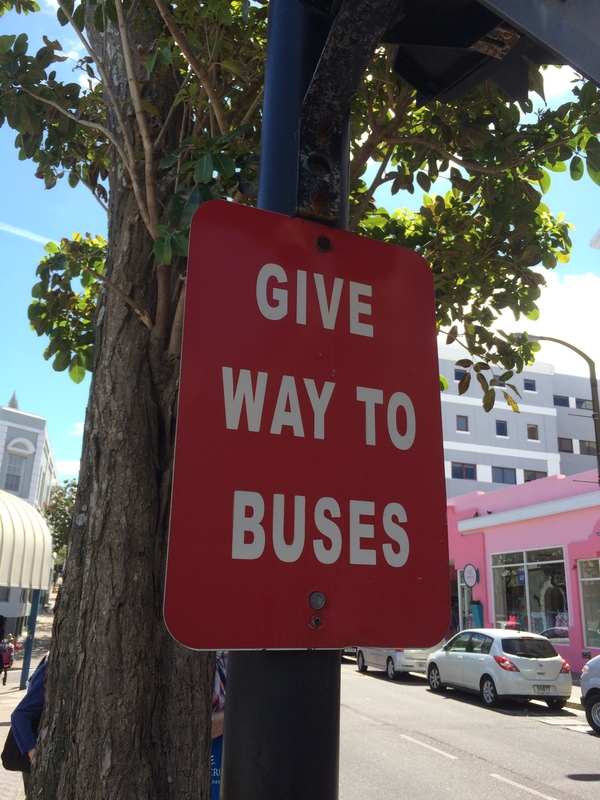 Buses have the right of way here, where every possible post boasts a sign that says, “Give way to buses!” I wonder what’s the rush, as buses fly by. 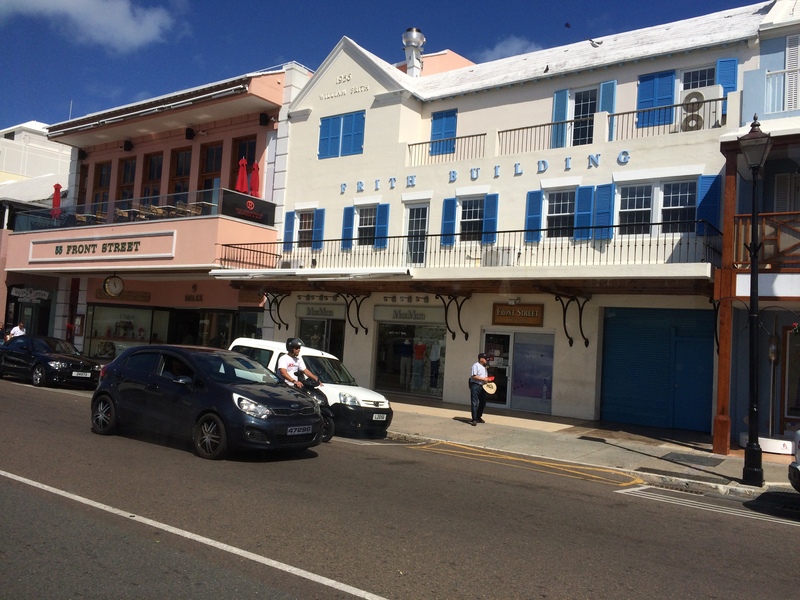 Once in town, we walked the streets and found shopping malls, churches and restaurants. 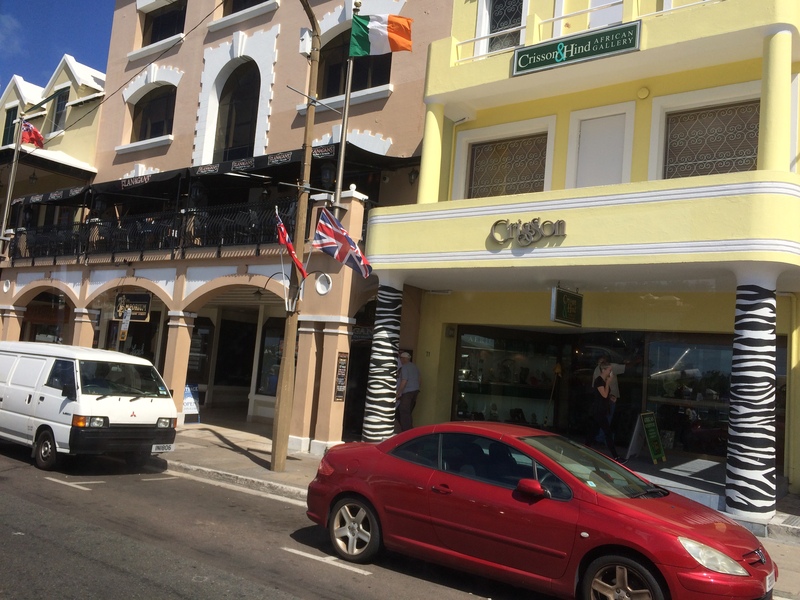 The history here is British, so traffic drives on the left, which makes American’s uneasy to say the least. 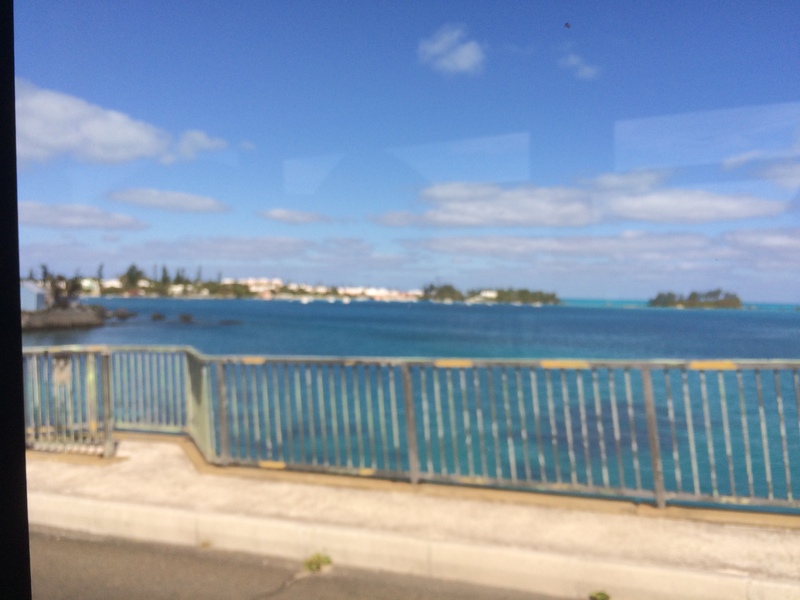 There are narrow, winding streets, so our bus ride was pretty much like a fast ride at DisneyWorld. I could see pedestrians hopping out of our path as we barreled through, barely missing bus stops! 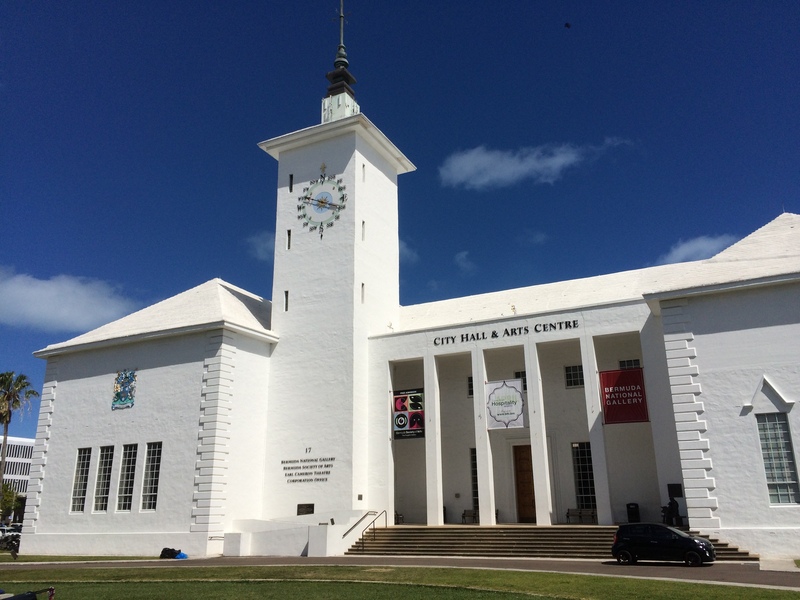 The City Hall and Arts Building caught our attention with its pristine white exterior and clock tower — very British! Our walking tour led us to a church with beautiful stained-glass windows and tall steeple. 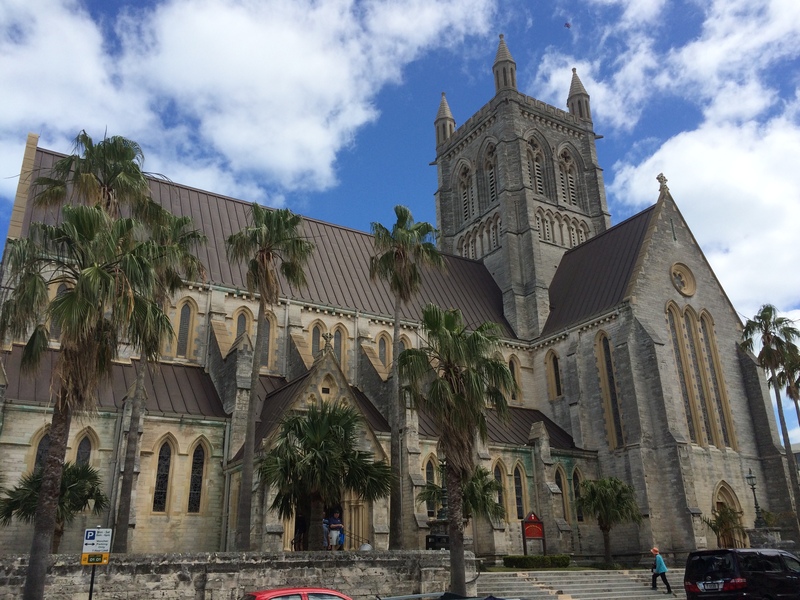 The Anglican Church of Bermuda, Cathedral of the Most Holy Trinity, was consecrated in 1911. Beautiful! 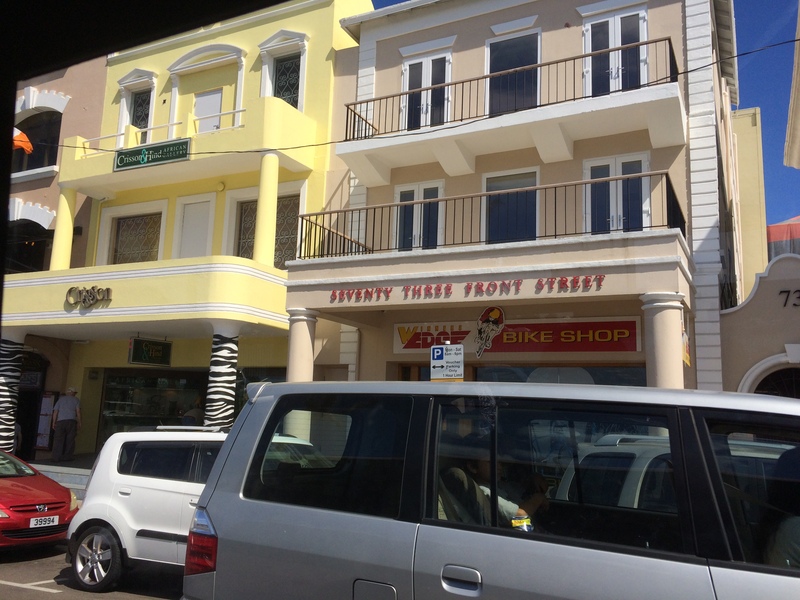 Walking around West End was exhausting on sloping streets, and often the walkway would lead to steps down to the next street level. 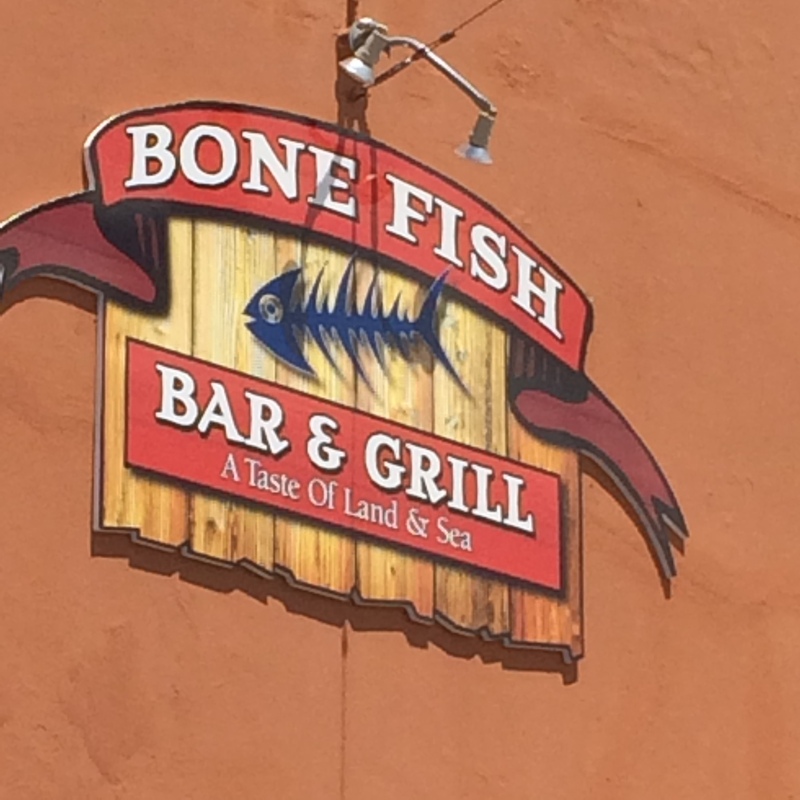 We decided to stop for a beer and snack at a restaurant with outside tables – Bone Fish Bar & Grill. Here was the best place to do some people watching, and enjoy our cold drinks during the heat of the day, which was still only in the 80’s. Our boat ride across the bay by water taxi was uneventful, although the scenery was well worth the effort. 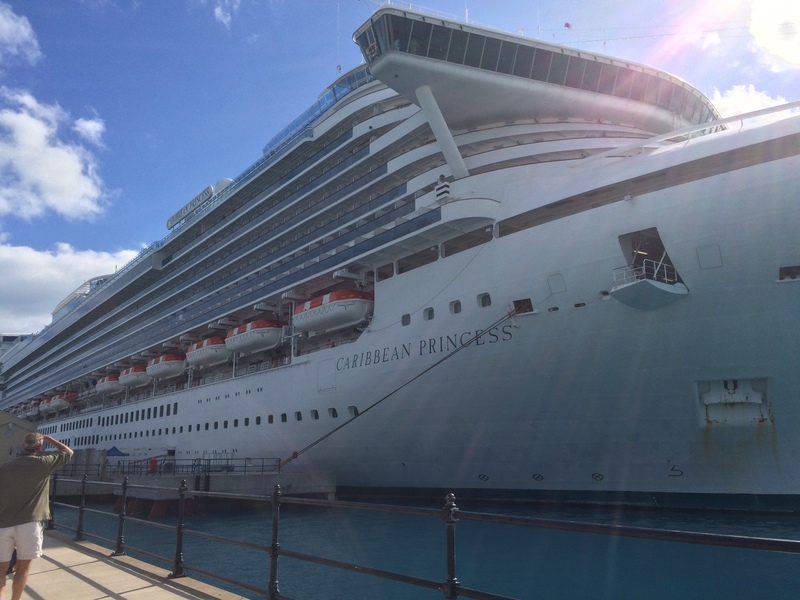 The Caribbean Princess would now set its course for Liverpool, England. Yes, that means we won’t see land for about a week on this trans-Atlantic voyage. Being flexible and packing lots of patience is the key! Our three-week 50th anniversary celebration cruise would take us to Fort Lauderdale FL, West End Bermuda, Liverpool England, Holyhead Wales, Hamburg Germany, Le Havre/Paris and ending in South Hampton/London. Elated and excited, our hopes and expectations are very high, as we maneuver through embarkation on the Caribbean Princess on April 17, 2016. 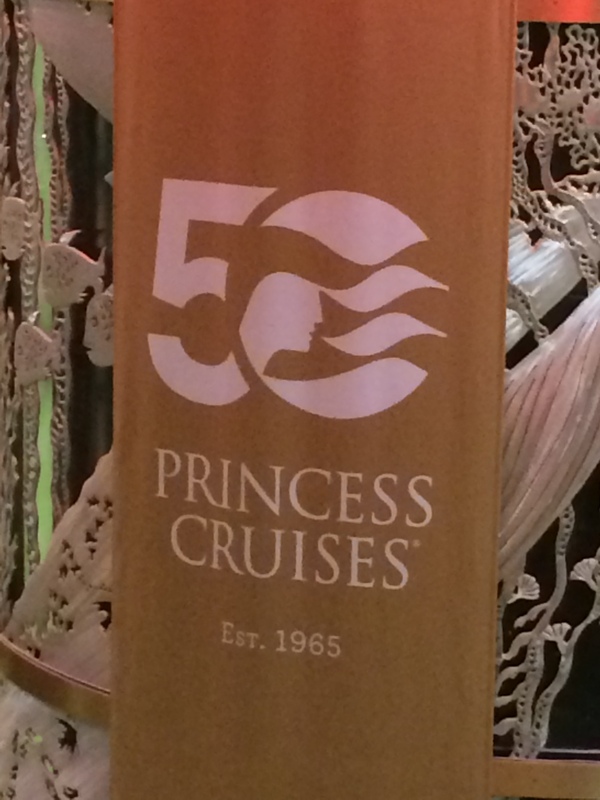 Coincidentally, the Caribbean Princess is also celebrating its 50th anniversary! It was 12:30 on a Sunday afternoon. Our good friend Tom dropped us off at the Bayport Cruise Terminal, since paying to park for three weeks was not an option for us. 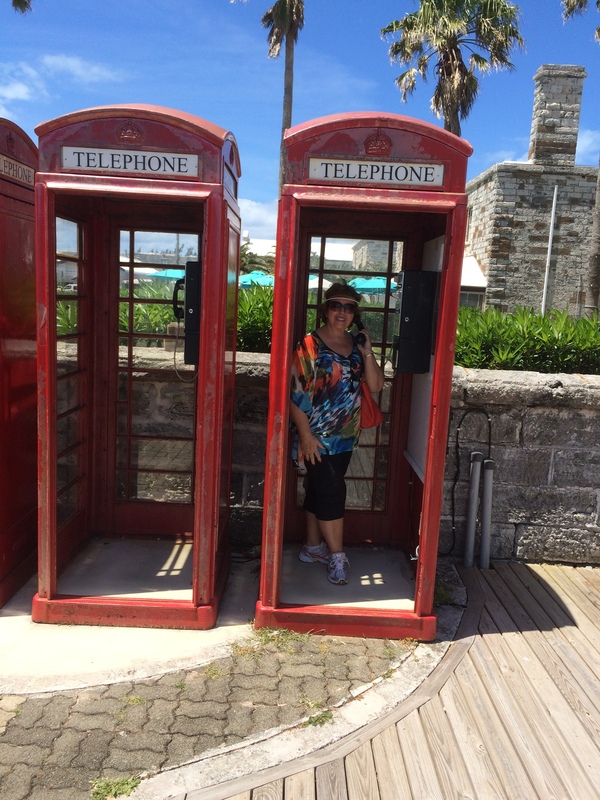 We checked our bags; checked in with passports; got our Cruise Cards, and boarded the ship. As usual, they require that you stop for your first onboard photo, before you take off on your own to discover the ship. We had three weeks ahead of us on this gorgeous vessel, where we planned to relax, be entertained and served gourmet meals every day. We also knew that we had several excursions already booked (online) and we were very excited for each one! Our bags arrived in our balcony cabin in no time at all. A Happy Anniversary poster on our door, along with balloons, greeted our arrival! “Princess Patter, your daily guide to life at sea” awaited us as well. In this newspaper, you can find any and all information you need for each hour of the day or night. Such as how to dress, where to eat, movies and times, stage shows, how to connect to the ships Wi-Fi, the names of your captain and other VIP crew members. This wealth of information made life onboard a little easier. We decided to get lunch in the Horizon Court Buffet before doing our self-guided tour of the ship. One thing we found out quickly is that it’s a huge ship! 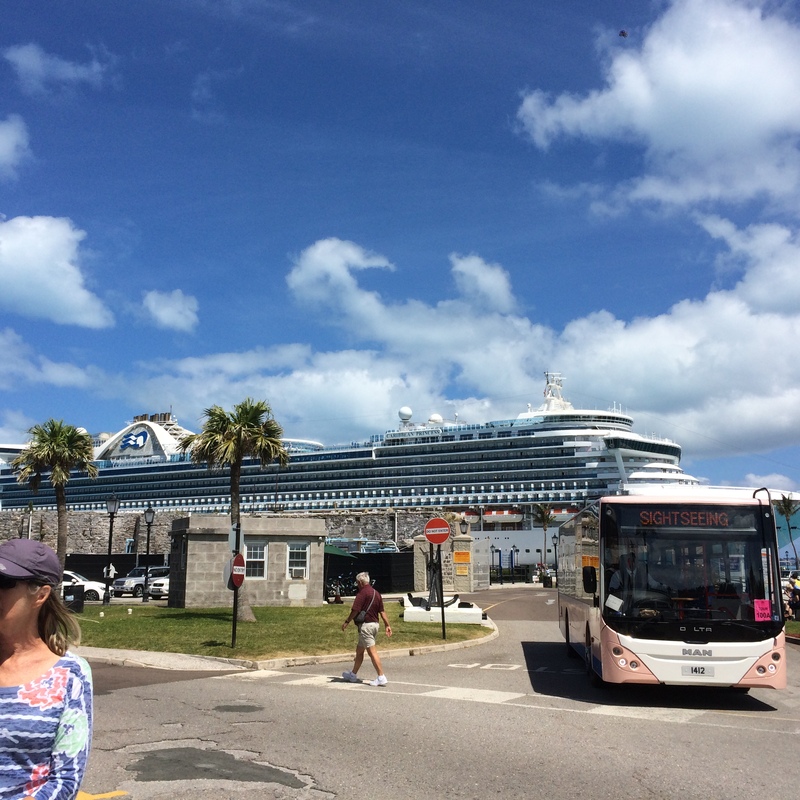 It’s sad to think that this would be the very last time the Caribbean Princess would depart from the Bayport Cruise Terminal, as the terminal is set to close in the very near future. It seems that the Houston Ship Channel is extremely busy, and the possibility of problems arising any minute that would interfere with cruise ships’ schedules is enough to deter them. After lunch we started our tour and discovered that on deck 15 Midship, Movies under the Stars was showing a Billy Joel concert, followed by a Bon Jovi Concert and an Elton Jon Concert. 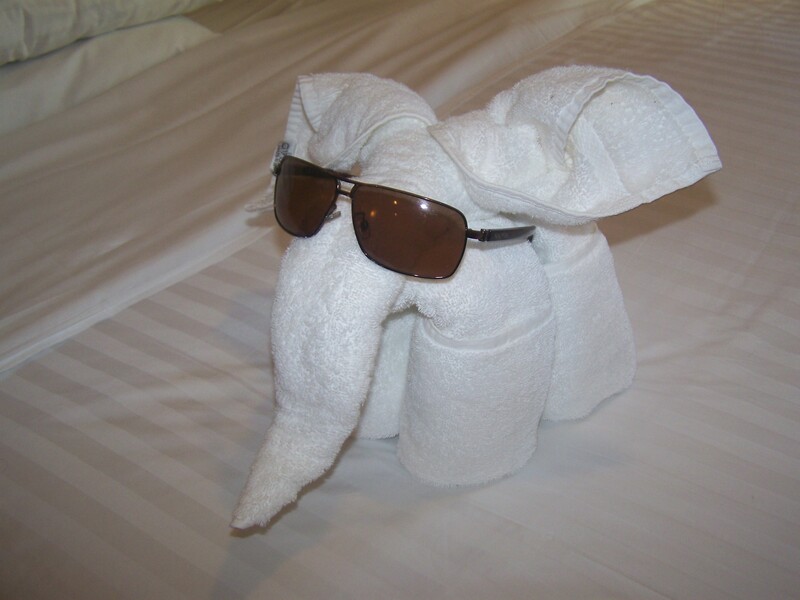 The cruise staff was preparing for the bon voyage party. At 5:15 p.m. that day, which is our scheduled dinner time, we met up with our friends Don and Margie and two other dining couples who would be regulars at our table each evening in the Coral Dining Room. Surprise! 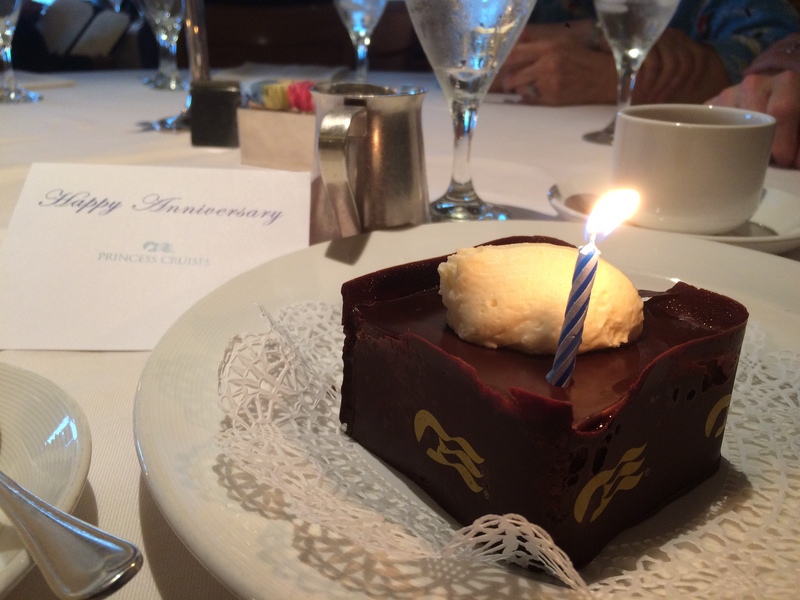 We enjoyed a wonderful anniversary celebration surprise – cake, song and a glass of wine! The wait staff at our table was always attentive and friendly, making us feel very special. My husband bought a Wi-Fi package. Yay! Since the weather was bad, we decided to watch a movie in our cabin and await our 1:00 a.m. departure time, according to the captain. The waves lulled me to sleep that night. We couldn’t believe we were still docked at the Bayport Cruise Terminal when we awoke the next morning. 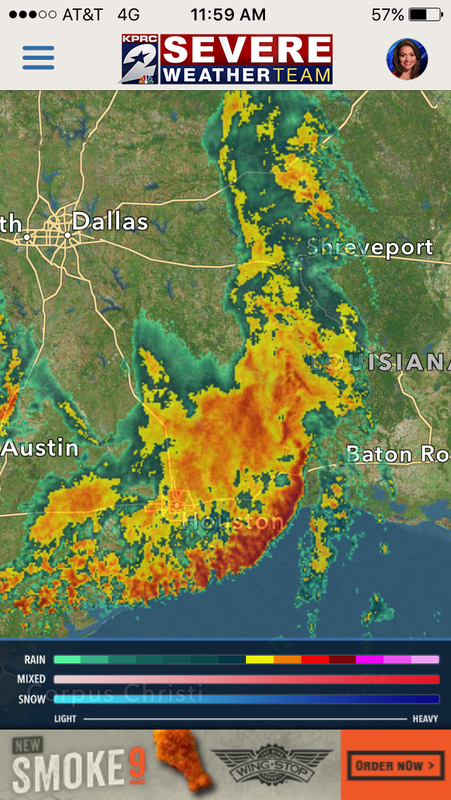 The delay was due to tremendous storms over the entire Houston/Galveston area, with high winds, flooding and tornado warnings, forcing the ship channel to close. Thankfully, we were safe onboard our ship at port during the tremendous storms. Finally, about 2:30 on Monday afternoon, April 18, the Houston Port Authority reopened the ship channel, and we’re finally on our way across the Gulf of Mexico toward our first port, Fort Lauderdale. Now we understand why the cruise lines are not happy with the Houston Ship Channel. The Amazing Spiderman movie was scheduled for the outside Movie under the Stars that afternoon, but I’m pretty sure that the weather prevented folks from enjoying it. There are plenty of other things to do inside where it’s dry. With so many activities going on at any given hour, there’s something for everyone! After breakfast at the buffet, we explored the ship further, had lunch, explored some more, then dinner and the day was almost gone. After dinner we made our first visit to the Grand Casino, which could not open until the ship was in international waters. In fact, none of the onboard shops could open until then either! The Gulf of Mexico is very rough now and the ship has picked up speed, causing it to rock and roll along. 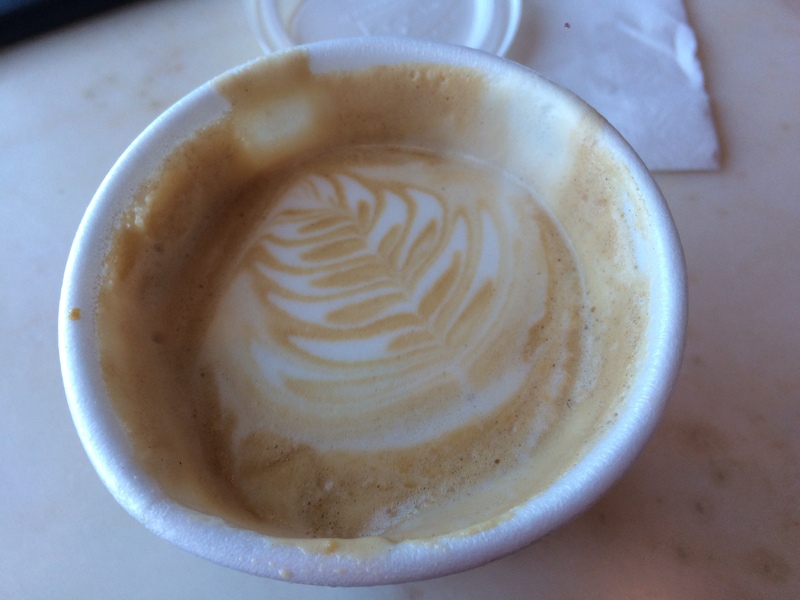 My husband bought a coffee card! Yay! We are celebrating our 50th wedding anniversary, so you won’t find us going to the clubs and bars at night often. 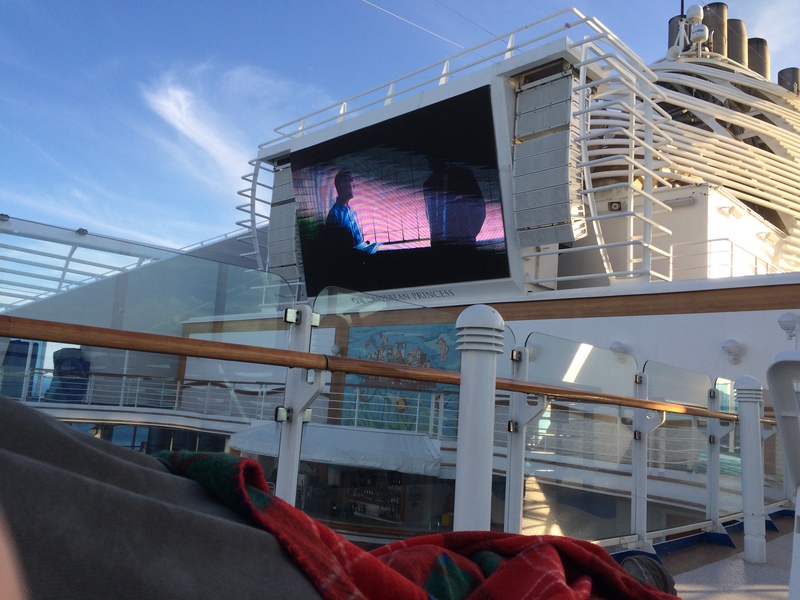 There are usually very good movies showing on the ship or on TV in our room, and we generally chose this option, after going to catch a stage show in the Princess Theater. The point is that you make your own schedule at your own pace. That’s the best thing about cruises! 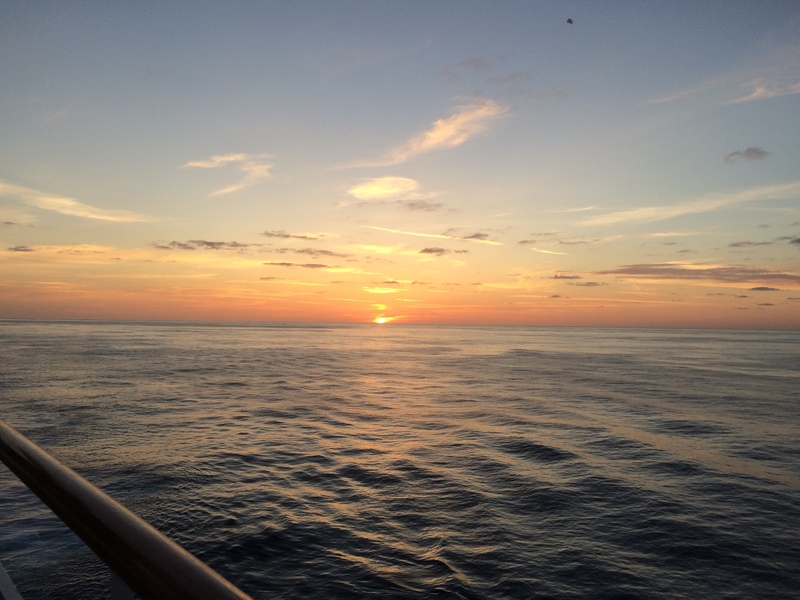 By Tuesday morning we had sailed out of the storm, and we awoke to a beautiful sunrise! Pink skies and calmer waters! This day would be laid back, enjoying the meals, the entertainment and the casino. That night we cozied up for Theater under the Stars and watched the movie “Concussion.” We decided to skip our dinner group and opted for burgers and fries with beer, while watching the movie. It’s a great way to spend the evening, watching the sunset and the first star of the night. I made a wish, of course! Due to the nearly 24-hour departure delay out of the Houston Ship Channel, our schedule was really off. 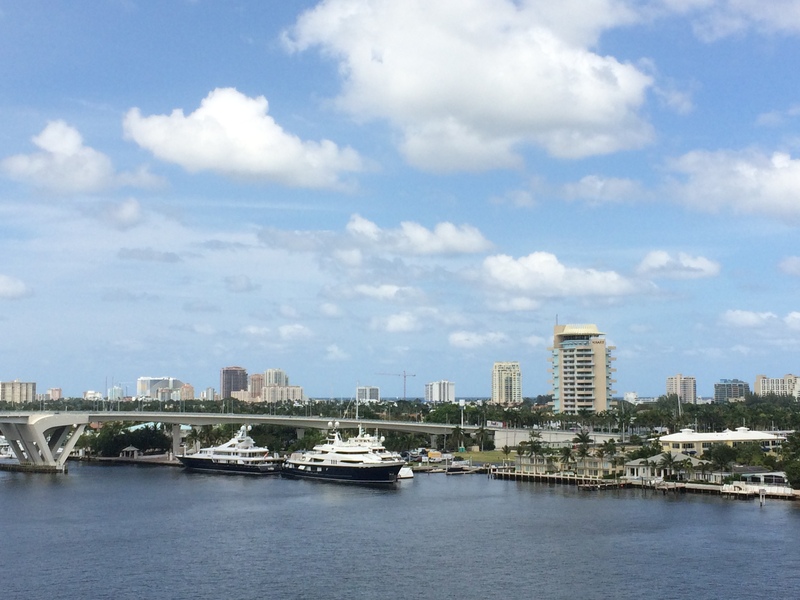 We arrived in Port Everglades/Fort Lauderdale on Wednesday in the afternoon, not that morning as was previously planned. 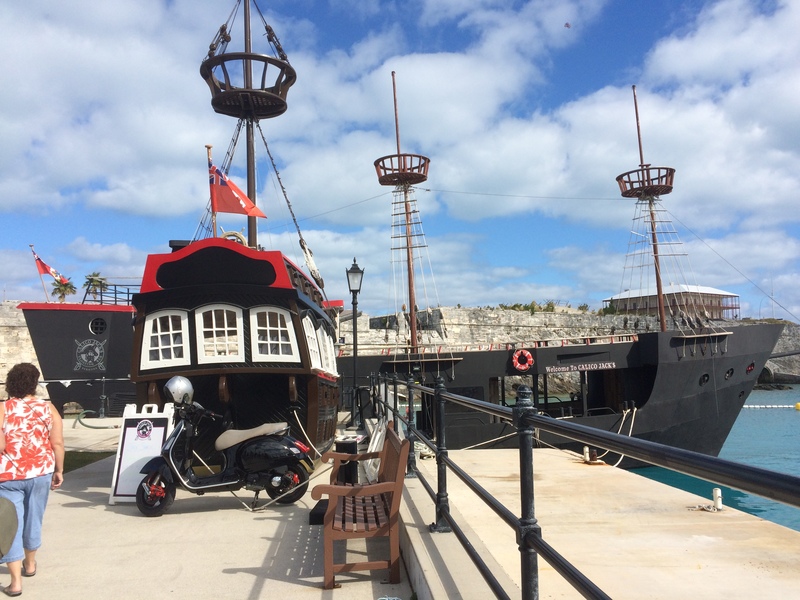 All shore excursions had been cancelled and could not be rescheduled, however, refunds were issued. 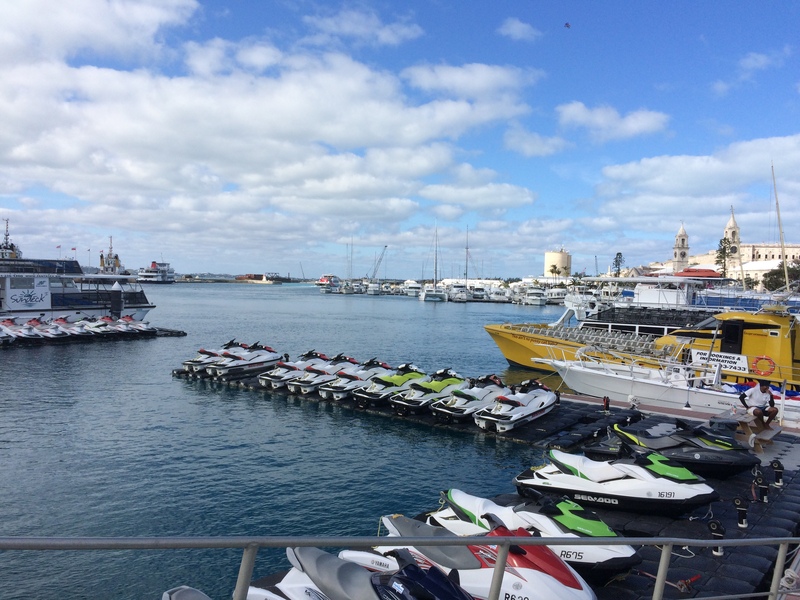 Therefore, we did not go ashore at Port Everglades, but we did get a good look at the port area and surroundings from deck. There were lots of yachts and sailing vessels of all sizes and enormous, elaborate homes by the water. Our plans to tour South Beach, Miami, would have to wait until another time. Fort Lauderdale is known as the Yachting Capital of the World. The fort was constructed in 1838 and the city was incorporated in 1911. There was a population of more than 165,000 in 2010. The area has been occupied by natives as far back as 4,000 years! It’s famous for its weather, beaches (7 miles), the Everglades, the inter-coastal waterway and cuisine, and it’s located only 20 miles from Miami’s South Beach. We had made dinner reservations in the Crown Grill for Wednesday evening, where we met up with Don and Margie. The filet mignon was perfect! 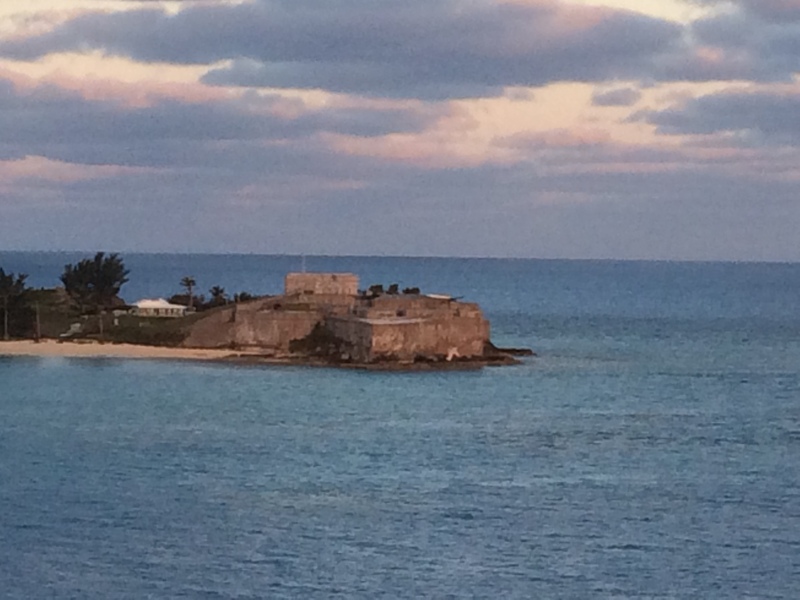 Sometime during the morning hours, after 2:00 a.m., we left Fort Lauderdale, Port Everglades, and headed for West End (Bermuda). Cruising across the Atlantic Ocean on The Mariner of the Seas is like living on a resort! Meals are served, rooms are kept clean and entertainment is provided all day and most of the night! On the ship you can be as active or as laid back as you want to be – it is up to you. Activities are available every day and every evening/night. Sometimes it’s nice to just chill! Now for some sailing statistics for all you sailors! 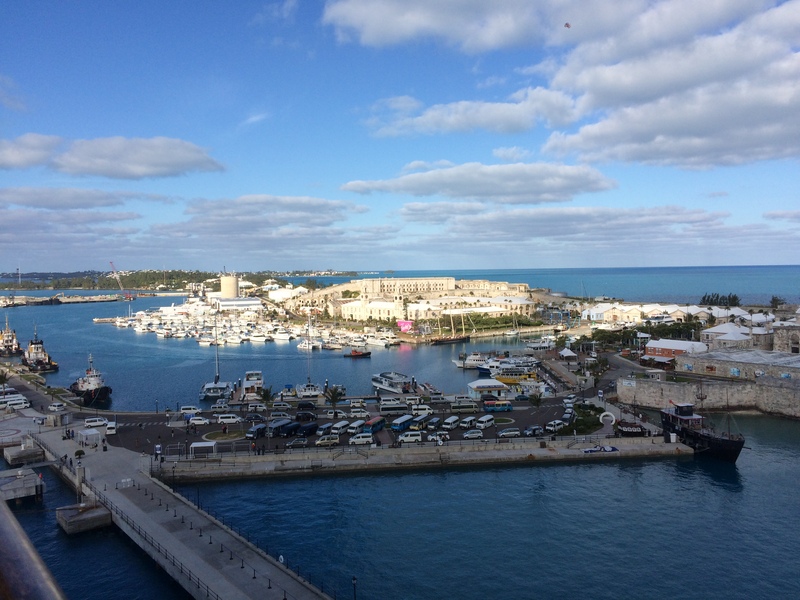 When we left the Port of Nassau on Wednesday, April 24, on day 4 of this 41-day cruise, the time of departure was approximately 5:30 p.m. The ship’s log is displayed on its own TV channel continuously, so we can see the stats anytime. Temperatures were in the 80’s on day 4, and we had traveled 1,132 nautical miles (nm). Our ship’s speed was 18.5 kts, and the sea depth was 10,180 ft.
By Thursday, April 25 – day 5, we had covered a total distance of 1,522 nm, sea depth of 17,870 ft., and it was exciting to see the color of the ocean waters change from Caribbean blue to a deep, dark navy blue, when the ocean floor dropped deeper below us. Temperatures had dropped into the 70’s with gusting winds, making it seem much cooler. Today is Friday, April 26 – day 6. At 4:40 p.m. we have covered a total distance of 1,924 nm, and the sea depth is 16,240 ft. This morning the sea depth was 16,990, so you can see that it fluctuates. We were nearing Bermuda, and at one point at 8:20 this morning the sea depth was displayed on the TV screen as 215,010 ft. We thought that couldn’t be right, but just figured that anything is possible in the Bermuda Triangle! The temperature is still cool tonight and expected to become even cooler as we cruise NE toward Funchal/ Madeira. After dinner last night we took in the stage production that was performed by the Royal Caribbean production team, which was an absolutely sensational Broadway-style show. Tonight Paul Tanner, an impersonator/singer from Killeen, Texas, wowed the audience while impersonating Neil Diamond, Tom Jones, Johnny Cash, Willie Nelson and Elvis, to name a few. We just left a 70’s party that is in full swing at The Promenade…so fun! Something that I forgot to mention, which makes an enormous impact on our day-to-day life on the ship, is the time change as we are on this journey on The Mariner of the Seas from Galveston to Singapore. As we sailed out of the Gulf into the eastern Caribbean in line with the tip of Florida at 11:30 a.m. on day 3, the ship’s captain asked that everyone set their watches forward one hour. After that, we have been asked to set our time forward one hour at 11:30 a.m. on several days. As of today, we have moved the time forward three or four hours – nobody can remember exactly. So we are sort of out of kilter, not knowing what time it truly is – we only know the ship’s time now. The first leg of this six-week cruise will end in Barcelona on May 6, and we have two more ports of call before we dock there. I’ll report on our stops at Funchal/Madeira, Portugal, and Alicante, Spain, next week followed by the last stop on this leg of the cruise – Barcelona! 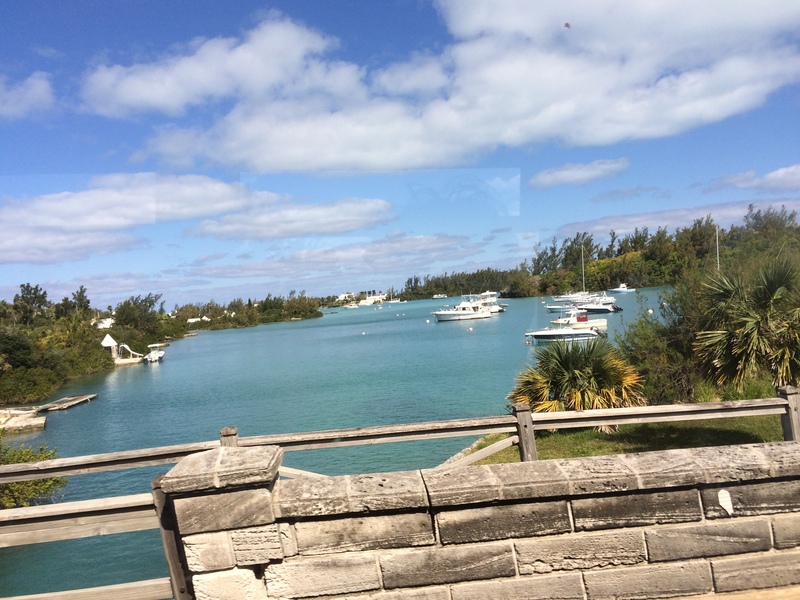 Saying goodbye to The Bahamas! 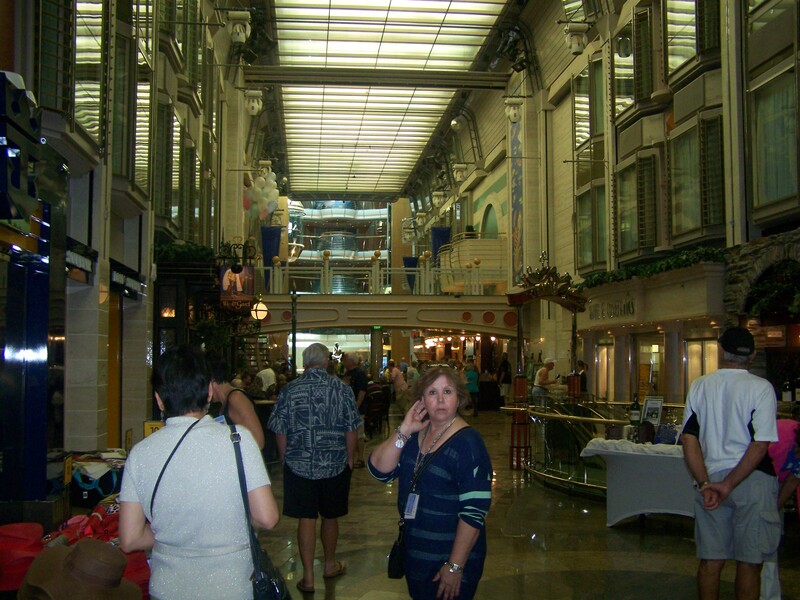 Everyone loves The Promenade in the center of The Mariner of the Seas!